How Egypt’s liberals lost control of their revolution. Four days later, I was in Giza’s lower-income Omraniya district across the Nile, where a massive crowd had packed into a colorful tent pitched in a dusty square. There, a leading parliamentary candidate for the Salafist Nour Party gave a speech in which he offered a very different take on Egypt’s uprising. “I thank the youth for the January 25 revolution,” said Sheikh Mohamed El Kordi. “Because they started it. This is why we are where we are now. ... We still have the revolution and the revolution is still on.” Nearby, a physician and local Nour Party leader, Ibrahim Kamel, was smiling. “In the old times, we couldn’t do this,” he whispered into my ear. Salafist political activity was prohibited under Mubarak; Kamel said he was imprisoned for a year in 1993 for passing around a petition. Now, Salafists were not only out in the open, but ascendant. Egypt’s revolution isn’t dead—but it has dramatically changed course. As Tahrir’s youth activists remain fixated on street protests, members of Islamist groups like the Nour Party and the Muslim Brotherhood have focused on the ballot box, winning over voters with promises of a sharia-based legal system that includes a ban on alcohol and interest-free banking. These parties took nearly 65 percent of the seats in the initial round of Egypt’s first post-Mubarak vote. (The elections are being held in three rounds to ensure there are enough judges to monitor every polling place.) Meanwhile, the liberal Egyptian Bloc won 14 percent and the Revolution Continues Alliance (RCA), a conglomerate of youth activists who attempted to transition from protesting to politics, won merely 4 percent. As another Salafist parliamentary candidate, Mamdouh Ismail, told the crowds in Omraniya, the country has entered “part two of the revolution, ... the time when the saviors enter parliament.” Needless to say, when Egypt’s pro-democratic youth activists took to Tahrir Square eleven months ago, the theocrats of the Nour Party were not the kind of saviors they had in mind. The success of the January 25 protests owed a great deal to Ezz’s strategic vision. At approximately ten that morning, leading activists from Egypt’s major pro-democratic youth organizations began marching from shaabi areas. Following instructions texted to their cell phones, lower-level activists met them at various points on the way to central protest locations that had been announced on the Internet. The goal, Ezz explained, was to create a snowball effect, so that the marches would swell as the demonstration neared the publicly announced locations, where the marchers would overwhelm the waiting police. The activists hardly expected this strategy to succeed on a vast scale: April 6 Youth leader Ahmed Maher told me he had expected no more than 3,000 people to participate, which would have been roughly three times the number who typically joined the group’s anti-regime activities. But, with the Tunisian revolution fresh in Egyptians’ minds, the chants of “change, justice, and social equality” resonated. Egyptians poured into the streets by the thousands, pushing into Tahrir Square from all directions. Eighteen tumultuous days later, Mubarak resigned. And it showed. For the next nine months, the activists demonstrated almost weekly on a wide variety of issues. Among other things, they demanded that a new constitution be drafted before elections were held, protested the SCAF’s use of military trials for civilians, called for the arrest of officials from the former regime, and advocated for the release of political prisoners. Noble though these efforts were, they often failed to attract meaningful support. This was partially due to a concentrated media campaign waged against them by the SCAF, which accused the protesters of accepting foreign funds, attacking government buildings, and fomenting chaos. But the Egyptian public also seemed genuinely ready to give the military-led transition a chance, apparently believing that Egypt’s next step depended on the November parliamentary elections and that the time for street protests had passed. By early October, Ezz and many of his colleagues had reached the same conclusion. As the parliamentary elections approached, the activists formed the RCA, bringing together 280 candidates under one electoral banner, including many leading youth activists from the January 25 revolt. Ezz announced his decision to run for parliament from his working-class neighborhood of Imbaba later that month, and he opened a small campaign office close to the center of his district. 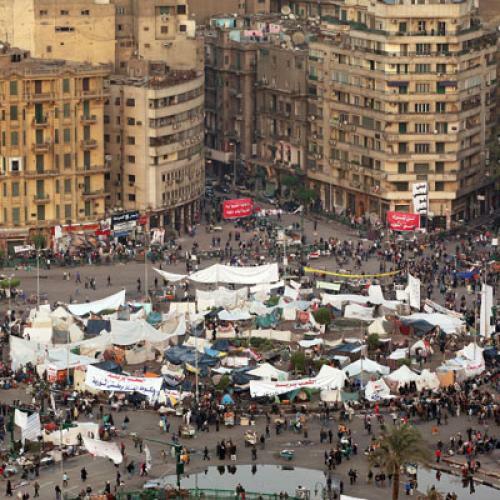 But, when a new round of mass protests erupted on November 18, after security forces violently cleared a small Tahrir Square sit-in, the RCA temporarily suspended its campaigns. Newcomer candidates such as Ezz were once again braving weapons-grade tear gas and occupying the square until the SCAF agreed to hold presidential elections by June 30, 2012. Ultimately, only one of the RCA’s individual candidates won in the first round, and he was an older member who had previously served in parliament. “I spent a week in Tahrir because of the incidents,” Abdel Rahman Faris, one of Ezz’s activist colleagues who ran in Fayoum for the RCA, told me. “So I campaigned for just two days.” That is, to say the least, no way to run in—let alone win—an election. Lacking much money, Faris managed to print just 40,000 brochures for a district of 700,000 voters. In the end, two Muslim Brotherhood candidates carried the district. EZZ’S DISTRICT, IMBABA, is holding its elections during the second round, which is slated to start on December 14. Imbaba is jokingly referred to as the Islamic Republic of Imbaba, and, when I visited, Muslim Brotherhood and Nour Party banners swamped the intersections. Both parties had recently opened local headquarters, and practically everyone I spoke with expressed their approval. “I’m with anyone who rules by sharia,” Ahmed Khalaf, 20, told me. “The Muslim Brotherhood is demonstrating and walking in the streets, and the people support them and are very organized.” The revolutionary activists, by contrast, seemed far less popular. When I met Ezz at his campaign headquarters, he rolled up in a three-wheeled tuk-tuk—an unsuitable campaign vehicle if there ever was one. After warmly greeting me, he quickly had to take a call. “They’re spreading rumors about me in the area,” I heard him say, referring to the Muslim Brotherhood. “There is no difference between the Muslim Brotherhood and the NDP”—Mubarak’s National Democratic Party. Meanwhile, two volunteers welcomed me into his tiny offices, which felt more like a one-car garage than a campaign war room. Smoke and trash were everywhere and, in the back, a massive, boxy computer sat on a decrepit desk. Eric Trager is the Ira Weiner fellow at the Washington Institute for Near East Policy and a doctoral candidate in political science at the University of Pennsylvania. This article appeared in the December 29, 2011, issue of the magazine.